May 28, 2010 — Robert K. Watts (Bob) an aviation pioneer and founder of Of Capital Aviation died on May 25th in the Bismarck Care Center at the age of 92. 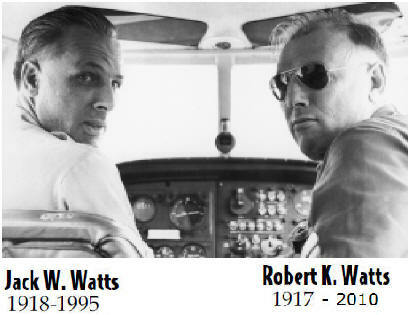 Robert Watts began flying shortly after his bother Jack got his private pilots license in 1939. Bob and Jack worked together in aviation for over thirty years. Bob was just a year younger to Jack, they were in separable. Jack became a flight instructor at the Bismarck Flying School while Bob worked as a radio engineer for a local station. During the early part of World War II both brothers taught in the War Training Service program. Jack flew gliders at Grand Forks, ND and Bob in Huron, SD. When government contracts ended both became civilian ferry pilots for the Air Force. Jack enlisted in the Air Force in 1943 and was stationed to India. Bob enlisted in 1944 and by fate joined Jack in India. Both Jack and Bob flew cargo and passenger missions over the Himalayas into China (“THE HUMP”) until the end of the war. Upon returning to Bismarck in 1945, the two brothers founded Capital Aviation. Hundreds of pilots and many career mechanics got their start at Capital. Jack and Bob worked on all sorts of planes from J-3s to jetliners. Bob was awarded the FAA Charles Taylor Master Mechanic Award in 1996. The brothers became one of the leading Cessna dealers in the region. The award is an 8-1/2 by 11-inch certificate and distinctive lapel pin. The certificate is signed by the FAA Administrator. Upon request, a stickpin similar in design to the lapel pin is also provided to the award winner’s spouse in recognition of his or her support to the award winner’s aviation maintenance career. Capitol Aviation pioneered many services. When FFA rules allowed scheduled- on-demand service, Capital provided service between Bismarck and Williston during the early oil field development in western North Dakota. Their planes flew missions using scintillometers and magnetometer instruments that confirmed the existence of oil in the Tioga Basin. Capital Aviation ferried equipment and supplies during the construction of the Garrison Dam. Capital pioneered game counts, grassland surveys and power line patrols. Capital Aviation certified the first twin-engine aircraft in North Dakota for Part 135 air taxi service. The brothers provided the first air ambulance service to Bismarck. Jack retired due to health reasons in 1973 and passed away in 1995.